Mayakovsky Public Garden: under the cover of mysterious Vitebsk. To seclude oneself from city life and plunge in a world of dreams, it is enough to visit Mayakovsky Public Garden in Vitebsk, cozy in a family way. The residents and visitors of tourist Vitebsk especially appreciate and respect this park for its harmony and unprecedented sense of calm and peace, blowing by melodic whisper of trees. If one day the fate wants to invite you in Vitebsk - do not resist, in fact, in this city you will experience fully the beauty of the expression "the life is beautiful". And you see that there are not only fascinating views of Vitebsk, but also its history. Walking through the city streets, you will everywhere meet amazing sights of Vitebsk, which, like a mysterious world, hide unsolved secrets of the ancient city. Along with the significant monuments of culture and art, Vitebsk parks should be also noted, which, as green oases, are reflected in the mirrored surface of the walls of modern architecture. Vitebsk public gardens, harmoniously complementing the landscape, make fresh notes to modern image of urban everyday life in Vitebsk. If you still have a question, what to see in Vitebsk, first walk in Mayakovsky Public Garden, which is located in the heart of Vitebsk. This is one of the most amazing places in the city where you can escape from the everyday fuss and enjoy the atmosphere of comfort and harmony. Mayakovsky Public Garden has a remarkable and rich history: it was created in the second half of the XIX century on the place of the square formerly known as Birgevaya. And since then, none event in the history of Vitebsk has passed unnoticed, but has been reflected in the haunting whisper of leaves of the city park, in the green heart of Vitebsk. The park got its modern name in 1927 in honour of the great russian poet and writer. 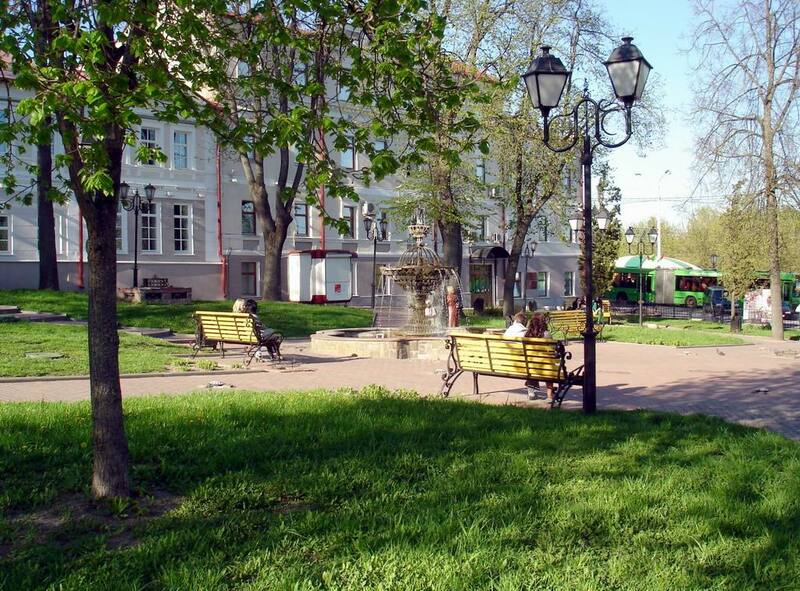 Today Mayakovsky Public Garden is a remarkable place in Vitebsk, where life, rapidly raging, acquires an extraordinary tranquility, comfort and convenience, and the soothing murmur of the green makes the heart easy and fun. To make the life play with the rainbow dyes, just complete a short trip in Mayakovsky Public Garden with acquaintance with other attractions of tourist Vitebsk, which are nearby. An easy walk across the space of Vitebsk would be greatly added by acquaintance with Suvorov Street. Playful chine of drops of "Three Sisters" fountain will fill your mood be filled with romantic tunes mood playful motifs fill chime drops. Amazing pages of history of the city are depicted in the Local History Museum and the Resurrection Church. What puzzles these buildings hide – a virtual tour in city portal VitebskCity.by will open the secret. The site of Vitebsk presents the attractions of the cultural capital of Belarus at a glance.